When Luck Runs Out. . . Some survived the war, but not the peace. Emerson Opdycke, at left, overcame a grievous wound at Shiloh—and was in the thick of things throughout the war—but mortally wounded himself many years later in an unfortunate accident. There’s no way to know how many rank and file Civil War veterans managed to survive combat and exposure to disease in the Civil War years, only to have their lives cut short in post-war years by something other than natural causes. Or how many succumbed to wounds or war-related ailments many years after the fact. The numbers would be staggering, no doubt. Not surprisingly, information on the demise of high-ranking officers and other officials is, by and large, easier to come by. 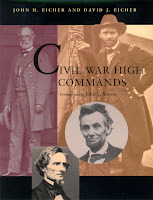 I compiled the following lists from John and David Eicher’s, Civil War High Commands (Stanford University Press, 2001). Just by chance, while looking up one individual or another, I came across two or three in short succession who had been murdered after the war, and a couple who drowned. Turns out it was not as common as it was beginning to seem, but it piqued my curiosity enough to do an electronic search of an early Eicher manuscript (my curiosity would not have been piqued enough to flip through 1,000 pages of the published book). I restricted my search to those members of the “high command” who were murdered, who drowned, or who suffered some other fatal accident. I excluded murders, drownings, and accidents that occurred between April of 1861 and April of 1865, since war certainly made all of those things somewhat more likely. I'm sure I missed a few entries in the Eicher book in which the search terms were not present (though the authors are consistent with the phrasing, for the most part). Missing from my lists, among others, are such notables as Clement Vallandigham and Allan Pinkerton, who did not fit the Eichers’ criteria for “high command,” but who made the cut on at least one website’s list of the “30 Strangest Deaths in History”—Vallandigham: “Death by Jury Demonstration,” and Pinkerton: “Death from Biting One’s Tongue” (scroll down at the link to find more details). Some of the deaths listed below are better known, like the mysterious drowning of Thomas Meagher, the subject of many narrative footnotes. Others came as a surprise to me, such as the drowning of George Wright, whose name came up here in discussions about Alcatraz, and McDowell. Didn't realize he died so soon after the war. Without further adieu, here is my unofficial survey of high commanders who were victims of murder, drowning, or other unhappy accidents. William Wirt Adams, CS: murdered by John Martin, a newspaper editor, in a quarrel on a street in Jackson, Miss., 1 May 1888; int. Greenwood Cemetery, Jackson. Joseph Bailey, US: murdered while acting as a sheriff in Nevada, Mo., 21 Mar. 1867; int. Evergreen Cemetery, Fort Scott, Kans. William Felix Brantley, CS: murdered by a shotgun blast at Winona, Miss., 2 Nov. 1870; int. Old Greensboro Cemetery near Tomnolen, Miss. James Holt Clanton, CS: murdered by political rival David M. Nelson, who shot Clanton 15 or more times with a double-barreled shotgun, at Knoxville, Tenn., 27 Sept. 1871; int. Oakhill Cemetery, Montgomery, Ala.
Archibald S. Dobbins, CS: believed to have been murdered near Itaituba, Brazil, 1869. Hiram Duryea, US: murdered by a deranged son, Brooklyn, N.Y., 5 May 1914; int. Woodlawn Cemetery, New York, N.Y.
Bryan Grimes, CS: murdered by William Parker, a hired assassin, Pitt County, N.C., 14 Aug. 1880; int. “Grimesland,” Pitt County; cenotaph in Trinity Churchyard, Pitt City, N.C.
Thomas Carmichael Hindman, Jr., CS: murdered by an assassin or assassins in the face, neck, chest, and hands, supposedly by members of the radical “Loyal League,” at Helena, Ark., 28 Sept. 1868; int. Maple Hill Cemetery, Helena. St. John Richardson Liddell, CS: murdered on the Black River steamboat SS St. Mary by Charles Jones (ex-Lt. Col. 17 La. Inf. ), in an action with its roots in the 1852 duels, 14 Feb. 1870; int. Liddell Cemetery, near Jonesville, Catahoula Parish, La. Edwin Stanton McCook, US: murdered while making a speech at Yankton, Dak. Terr., 12 Sept. 1873; int. Spring Grove Cemetery, Cincinnati, Ohio. Theodore A. Ripley, US: probably murdered in Emanuel County, Ga., 23 July 1866; int. Evergreen Cemetery, Winchester, Vt.
William Feimster Tucker, CS: murdered at Okolona, Miss., 14 Sept. 1881; int. Odd Fellows Cemetery, Okolona. Orville Elias Babcock, US: drowned in Mosquito Inlet, Fla., 2 June 1884; int. Arlington National Cemetery, Va.
Charles Gratiot Bartlett, US: died New York, N.Y. by drowning in Staten Island ferry boat collision on 14 June 1901; int. West Point National Cemetery, N.Y.
Henry Haywood Bell, USN: drowned at Osaka, Japan, 11 Jan. 1868; int. Hiogo, Japan. Samuel Thompson Busey, US: drowned while fishing at Mantrap Lake, Minn., 12 Aug. 1909; int. Woodlawn Cemetery, Urbana, Ill.
Henry Boynton Clitz, US: disappeared and supposed to have drowned at Niagara Falls, N.Y., 30 Oct. 1888; cenotaph in Elmwood Cemetery, Detroit, Mich.
Thomas Francis Meagher, US: died 1 July 1867, during a drinking party aboard the SS Thompson near Fort Benton, Mont. Terr., when he fell into the Missouri River and drowned “under mysterious circumstances;” his body was never recovered. Samuel Ross, US: died by drowning, Jefferson Valley, N.Y., 11 July 1880; int. Lancaster Cemetery, Lancaster, Pa.
William Terry, CS: drowned in Reed Creek (near Wytheville), Va., 5 Sept. 1888; int. City Cemetery, Wytheville, Va.
Alfred Thomas Archimedes Torbert, US: drowned off Cape Canaveral, Fla. in the sinking of the SS Vera Cruz, 29 Aug. 1880 (his body was recovered 31 Aug. 1880); int. Methodist Episcopal Cemetery, Milford, Del. James Henry Van Alen, US: missing and presumed drowned when he fell overboard from the SS Umbria, Atlantic Ocean, 22 July 1886. George Wright, US: drowned off Crescent City, Calif. in the wreck of the SS Brother Jonathan, 30 July 1865 (his body was recovered at Bay Flat, Calif., in Oct. 1865); int. City Cemetery, Sacramento, Calif.
Alonzo Granville Draper, US: died from an accidental gunshot wound, Brazos de Santiago, Tex., 3 Sept. 1865; int. Pine Grove Cemetery, Lynn, Mass. Thomas W. Grosvenor, US: killed by accident by a sentry during the great fire, Chicago, Ill., 21 Oct. 1871; int. Oak Woods Cemetery, Chicago, Ill.
Heber Le Favour, US: killed in carriage accident, Pawtucket, R.I., 25 Feb. or 25 July 1878; int. Swan Point Cemetery, Providence, R.I.
Samuel Emerson Opdycke [photo at top], US: mortally wounded when he accidentally shot himself in the abdomen, 22 Apr. 1884, and died New York, N.Y., 25 Apr. 1884; int. Oakwood Cemetery, Warren, Ohio. Francis Engle Patterson, US: died when he was accidentally shot or committed suicide at Fairfax Court House or near Occoquan, Va., 22 Nov. 1862; int. Laurel Hill Cemetery, Philadelphia, Pa.
Israel Canton Smith, US: killed accidentally while hunting near Grand Rapids, Mich., 27 Nov. 1899; int. Oak Ridge Cemetery, Grand Rapids. Frederick Steele, US: died from an injury in a buggy accident, San Mateo, Calif., 12 Jan. 1868; int. Woodlawn Memorial Park, Colma, Calif.
William Warren Stewart, US Commission Agent: killed in a railroad accident, Chicago, Ill., 6 Dec. 1893; int. Marengo Cemetery, Marengo, Ill.
There’s something about Civil War veterans who go on to make their mark as explorers that really piques my interest. Two that have been the subject of modern biographies are worthy of mention here. I’m readying a more detailed post on John Wesley Powell, about whom much has been written, he who lost an arm at Shiloh, and who went on to navigate the Colorado River. In 1861, when he was living in Arkansas, Stanley felt obliged to enlist in the Confederate Army because someone had sent him a petticoat, implying he was a coward. Captured the following year at the Battle of Shiloh, he was taken to Chicago to a federal prison camp and subsequently released on condition that he join the Union Army. But while stationed with the artillery in West Virginia, he was prostrated by dysentery and left in the local hospital when his regiment moved on. Although he later claimed he had been discharged, he had actually been told to rejoin his unit when his health improved. His refusal to do so thus turned him into a deserter. On his return to America in 1867, Henry Stanley finally discovered what he was good at: describing battles and other adventures in the newspapers. 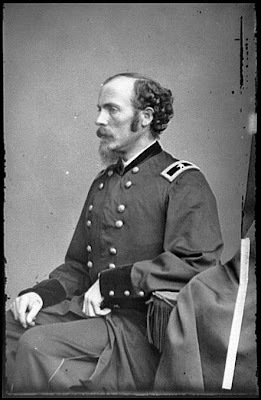 During a year in which he reported for the Missouri Democrat on expeditions against the Cheyenne and on negotiations between the Plains Indians and the government, Stanley got to know Wild Bill Hickok, Colonel George A. Custer, and General William Tecumseh Sherman, who later told him that his journey to Livingstone was a greater feat than his own "March to the Sea." 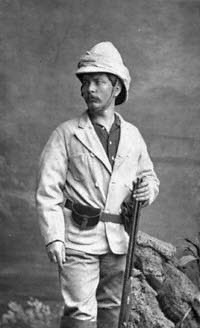 His success as a journalist convinced James Gordon Bennett Jr., the proprietor of the New York Herald, to hire him to cover a British expedition to Abyssinia, to write about the 1868 revolution in Spain, and, more famously, to "FIND LIVINGSTONE," an injunction that, as Jeal points out, was much dramatized in Stanley's account of the negotiations. Adult readers of history have to unlearn many of the things they remember from their schooldays. This is especially true of quotations of famous people because before the invention of tape recording virtually anything they said from the Old Testament onward was almost certain to be misquoted unless they wrote it down themselves. The correction of misquotations is often a relief. It is good to learn that the Duke of Wellington could not have made the foolish remark that "the battle of Waterloo was won on the playing fields of Eton": apart from the absence of evidence, the school's fields were not used for organized sports when he was a schoolboy in the 1780s, and in any case he never played on them. But sometimes it is sad to find that well-remembered sayings—pithy, pungent, and redolent of the speaker—were never uttered, that Oliver Cromwell did not dismiss the Rump Parliament with the words "Take away these baubles," that he never told the painter Peter Lely to depict him "warts and all." These are the historical equivalents to learning that Sherlock Holmes never said "Elementary, my dear Watson," or that Humphrey Bogart in Casablanca does not say "Play it again, Sam." Now comes an even greater shock. In his impressive, revealing, and well-written biography of the explorer Henry Morton Stanley, Tim Jeal argues that the most famous greeting in history was never delivered. As a child I saw an engraving of the meeting between Stanley and David Livingstone above the caption "Dr Livingstone, I presume." I loved both the greeting and the picture of the two strangers, surrounded by Arabs and Africans, solemnly doffing their hats on the shore of Lake Tanganyika. More impressed than I am now by the virtues of being laconic, hlegmatic, and English, I admired the formality and sangfroid of men who, after long and hazardous journeys, had finally met in "darkest" Africa. The later discovery that Stanley was a Welshman pretending to be an American, and that he had prepared a greeting in the style of an English gentleman, added pathos as well as absurdity. So did the knowledge that the greeting swiftly became a joke in London's music halls. Yet according to Jeal, nothing memorable was actually said, and Stanley invented the words afterward when he wanted to infuse the occasion with a striking phrase. Thus he was forced to cut out the pages in his diary that described the encounter. But he could not censor Livingstone's letters, which record the meeting in detail to various correspondents, and do not mention any such greeting. One of the many ironies of Stanley's life is that he is remembered more for a remark he did not make than for his career as the greatest explorer of the nineteenth century. I stumbled upon a "huge depository of Unusual Links about Abraham Lincoln" here at the always engaging Grow-a-brain blog (there's a nice list on Nixon as well). It's a grab bag sure to cause you to lose more precious time—some of it is obscure and riveting, like the photo of Abraham Lincoln's business card above. Click on the image to read the small print, which makes mention of Abe's difficulty in "crossing the stream." The Library of Congress source link says this was "probably printed by the Democratic Committee in 1864." Much of it is irreverent, like the once heavily circulated Gettysburg Address Powerpoint Presentation. For those of us who spend much time in company conference rooms, this Powerpoint parody still retains its power. 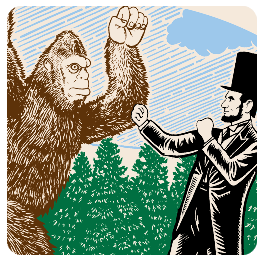 Or this attractive T-Shirt: Bigfoot versus Abe Lincoln. For this and other unique apparel, visit the fine folks at Glarkware. I love the sales copy. We're accustomed to researching historic figures and discovering all their flaws. "But wouldn't it be great if scholars peered into the lives of your most beloved historic figures and discovered that they were even cooler than you thought?" Like the time Abe came to blows with a Sasquatch. Below is a Lincoln photomosaic using contact prints or just very small Civil War photographs. I bought a copy of this in the gift shop at the Library of Congress many years ago—I imagine they still sell it. It's a pretty remarkable effect. 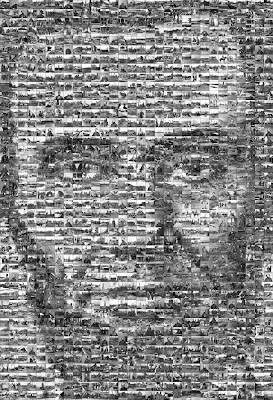 Click on it for a larger view—you may be surprised at how many of these miniature images are instantly familiar.